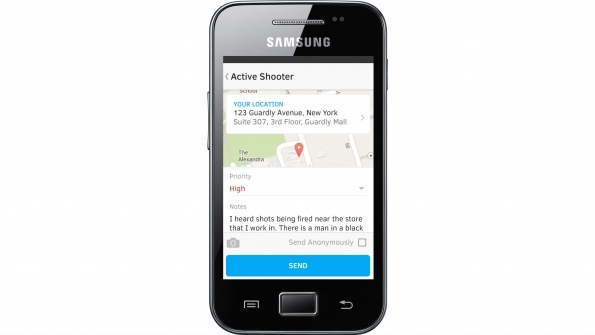 Toronto-based Guardly says it can leverage a burgeoning technology—beacons—to provide accurate and specific indoor-location information quickly during an active-shooter incident. Guardly’s Enterprise E911 solution is a smartphone application that uses indoor-positioning-system (IPS) technologies—specifically Wi-Fi and beacons—to pinpoint a person’s location inside a building, down to the room and floor level, according to Guardly CEO Rob Moffat. The solution can help security personnel quickly locate an active shooter—a critical factor, because most shootings are over by the time first responders arrive on the scene—and provide real-time information to law enforcement from those in the building. While the solution can utilize Wi-Fi access points or beacons, Moffat said a hybrid approach is more ideal. And both Wi-Fi and beacons increasingly are already in place, especially in retail and entertainment environments, where marketers want to track foot traffic and where crowds tend to gather for large events like football games. Beacons are especially key for accuracy and flexibility, Moffat said. Beacons, which have signal radii of three to 160 feet, broadcast Bluetooth Low Energy radio signals to nearby devices. The beacons allow Guardly to create a 3D map of a building that is designed to help the user better visualize where staff, security and tenants are at any time. But the challenge for IPS can be large, open spaces, such as a three-story food court in a mall. Guardly’s IPS solution was recently part of a mock-terrorism exercise with a retail customer in Indianapolis, as well as an active-shooter scenario and other use cases. During the mock terrorism exercise, improved communications due to indoor-location information and the ability to share video with law enforcement proved critical. “They found they were able to communicate much faster with the app, because the app already knew where the users locations were,” Moffat said. In January, the company plans to release enhancements, such as a chat component for secure group communications and location-based forms for routine maintenance, like a fire-extinguisher inspections. Guardly will still offer a “Guardly Lite” version that uses GPS.